timber frame, mantel piece, home decor, gift and more. Voyage to the next stage of creation. 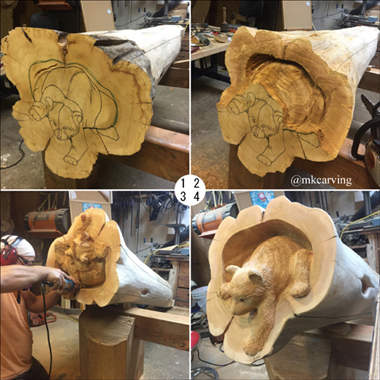 MK carving and sculpting is located in Abbotsford, BC, Canada and has been operated since 2005 as a creator of custom woodcarving and other sculpture. Japanese-Canadian Artist, Mori Kono has over 20 years experience in the field and has been recognized as a quality architectural wood carver and wild life sculptor by Log home industries, Contractors, Galleries , Millwork industries and Public Arts in Canada and US. We added CNC machining and Wood Turning services for responding the market demand. Small wood signs,plaques or Turned spindles etc can be created within a reasonable price range. ex. : eagle, bear, cougar, etc. as well as wood signs, architectural decors, totem poles, memorial woodcarving and educational projects for schools. Most of our woodcarving have fine finishing touch with hand chisels especially on door carvings, which brings out maximum beauty of wood characters. This quality touch is our pride and we are believing that our intense effort with harmonious passion is connecting us with art lovers in Canada , US and other continents. Please feel free to download our PDF brochure for one of your woodcarving resources. Occasionally we are E-mailing our new work images of wood carving to our mailing list members. You are very welcomed to join it. 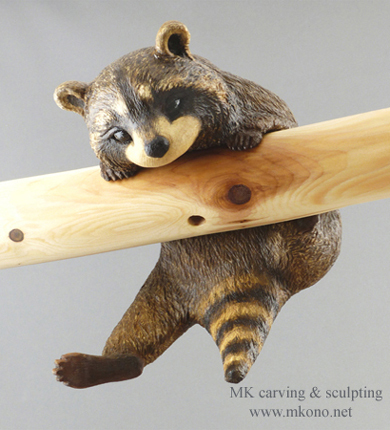 Thank you for visiting MK woodcarving gallery ! busy 2017 and couldn't update our Gallery pages at a regular base. Please visit our Facebook or Instagram . Thank you!! Dec-23 A Merry Christmas and Happy New Year! Wishing you very best health and happiness in 2017. Dec-25 Merry Christmas and happy New Year 2016! Wishing you happiness and joy in this holiday season. 2015 Nov-7 We have rainy season again here in BC. I hope everyone is doing well. Please check our Facebook page for new works and updates. Currently our schedule is booked till end of January 2016. Thank you! Oct-24 Please track Facebook page for newest works. This year's shipment is all booked. We'll accept orders for next year shipment. Thank you. May-20 "Work in progress" is updated. May-1 "Gallery 1&2", "Work in progress" are updated. Mar-30 "Gallery 1&2", "Work in progress" are updated. Our carvings will featured in this program. We appreciate your interest and support in 2013. Wishing you all the best in the holiday season and coming 2014. Nov-8: Public Art "Soaring" installaion completed in City of Saskatoon, SK, Canada. June-10: "Work in progress" is updated. Thank you very much for your interest and stopping by MK carving site in 2012. Wishing you the best in new year 2013. Dec-27: "Work in progress" is updated. Jul-22: Featured program of MK Carving through Yomiuri TV Japan will be on air. Jun-8: Carving demonstration for Grade 1-5 at Dr.Roberta Bondar elementary school in Abbotsford. May-18~26: "Vancouver Craft Beer Week" 60 breweries will be rocking! between 5-8pm. Our work will be in for donation. Mar-2,3,4: We will be in "BC Boat and Sportsmen's Show" at Tradex in Abbotsford Airport. We are open boxing day's(26th) week and from 2 Jan 2012. Dec-26: "Work in progress" is updated. Oct-1: We will be in "Help Japan Bonsai Fest (Silent auction)"
start from 11:30am in Surrey.